The Wedding ring that Catherine Middleton will wear will be made of Welsh Gold. 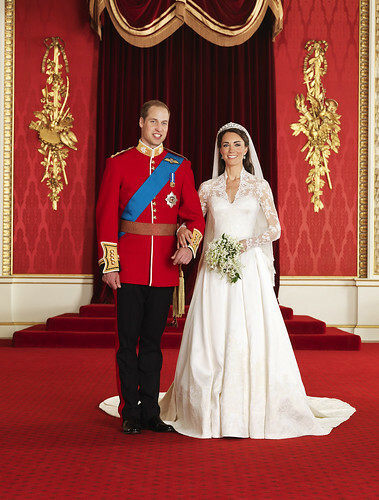 The gold was given to Prince William by The Queen shortly after the couple were engaged. It has been in the family's possession for some years and has been in the care of the Royal Jewellers. There are no further details on which mine the gold was mined from. More information about the ring may be released closer to the Wedding Day. There will only be one ring, in accordance with the couple's wishes. The ring will be from Prince William for Catherine. The wedding rings of The late Queen Elizabeth The Queen Mother, The Queen, The late Princess Margaret, The Princess Royal and The late Princess of Wales were all made from the same nugget of Welsh Gold, which came from a Welsh mine, Clogau St David’s at Bontddu, North Wales. In November 1981, the Royal British Legion presented The Queen with 36-grammes of 21 carat Welsh Gold, part of this gold went into the making of the ring worn by Sarah, Duchess of York (1986). The Wedding rings worn by The Earl and Countess of Wessex are made from Welsh gold, too (possibly from the piece presented in November, 1981). The Prince of Wales wears his wedding ring under his signet ring.